Stumbling out of bed, I skipped the shower, brushed my teeth, and stepped outside into the cool darkness. Craning my head toward the night's sky, I was greeted with a scattering of white stars. It was a good sign. In a trip filled with early mornings, getting up at 3 AM to watch the sunrise over Mount Bromo in East Java was the earliest. We'd been warned to dress warmly, as temperatures can drop close to freezing, but I didn't even find a hat or gloves to be necessary. Upon meeting the rest of the group outside the entrance to Java Banana Lodge, we piled into a caravan of 1970's-era BJ40 Toyota Land Cruisers for the short ride up to the lookout point. After 15 minutes of twisting and turning in the dark, we reached the parking area at the foot of a dirt path leading further up Mount Penanjakan (2,770 meters). From here, we were on foot. 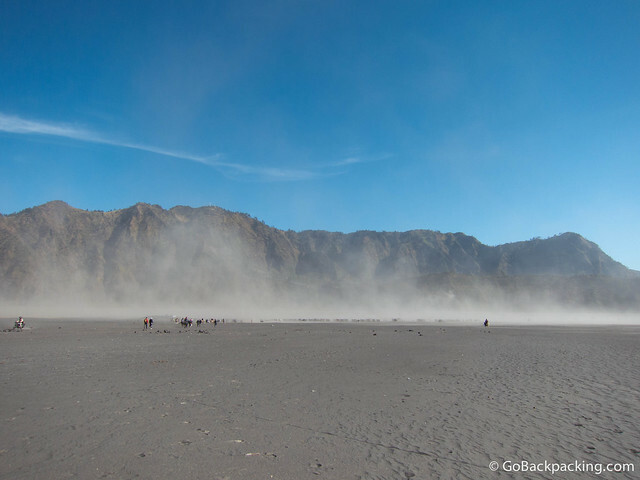 It was hard to see in the pre-dawn hours, but the entire path at this point was covered in a fine layer of grey ash from Mount Bromo's latest eruption in 2011. 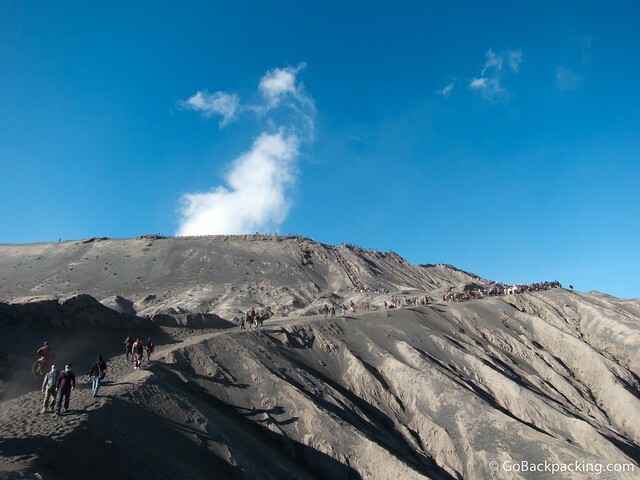 At 2,292 meters, Mount Bromo is hardly the tallest mountain in Indonesia (that would be the 4,884 meter Puncak Jaya on the island of New Guinea), but it draws a crowd on account of its setting. The walk to the lookout point took 20 to 30 minutes. By 4:30 AM, a crowd of several hundred tourists and their guides had arrived for sunrise. Coffee, tea, and snacks were being sold by the members of the indigenous Tengger community, whose ability to wake up at an ungodly hour every morning amazed me. While the Javanese are predominantly Muslim, the Tengger practice Hinduism. Our guide handed us surgical masks to help protect against the ash being kicked up by all the people. I felt funny wearing it at first, but later, it'd be essential to hiking on Mount Bromo. The first signs of sunlight began to appear behind a horizontal band of clouds hovering over the horizon. Unlike the sunrise at Borobudur Temple, it appeared we were going to be in for a colorful sky. Forty five minutes later, at 5:15 AM, I was watching one of the most spectacular sunrises of my life. 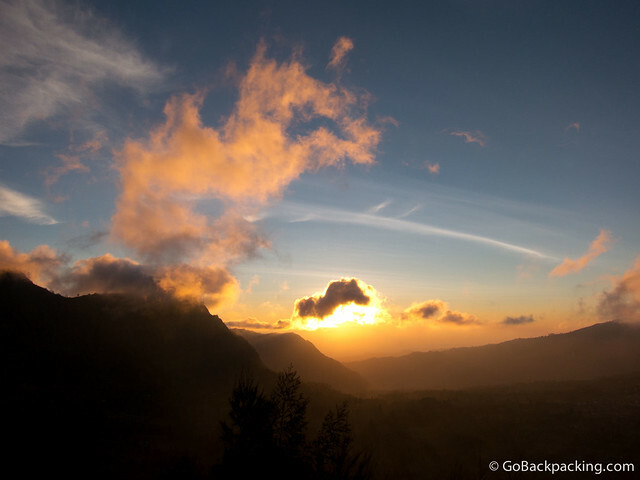 The sun also cast a warm glow over Mount Bromo, and the surrounding Sea of Sand, the name given to the vast plain between us and the volcanos. Almost as soon as the sun had risen, groups were already leaving the lookout point for the drive down to the plain, and subsequent hike to Mount Bromo's crater. Our group lingered, taking photos, and was therefore one of the last to make its way down the mountain. Upon reaching the Sea of Sand, we began driving over a carpet of grey ash. 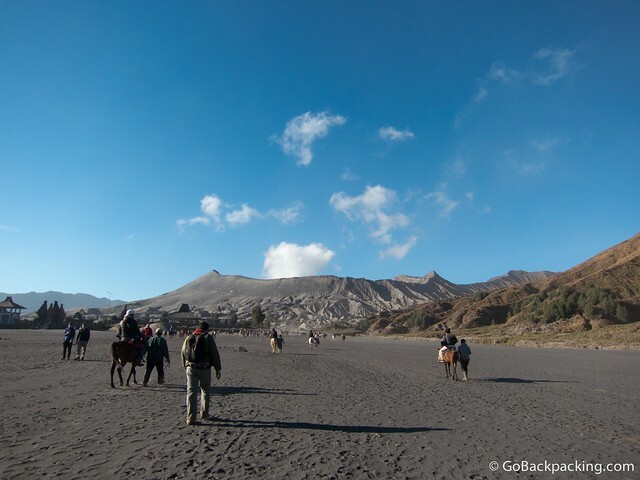 In the parking area, we were immediately approached by locals offering horse rides to the crater. A few people in our group chose the horses, while the majority, including myself, opted to walk. It's at this point that the surgical masks became necessary. 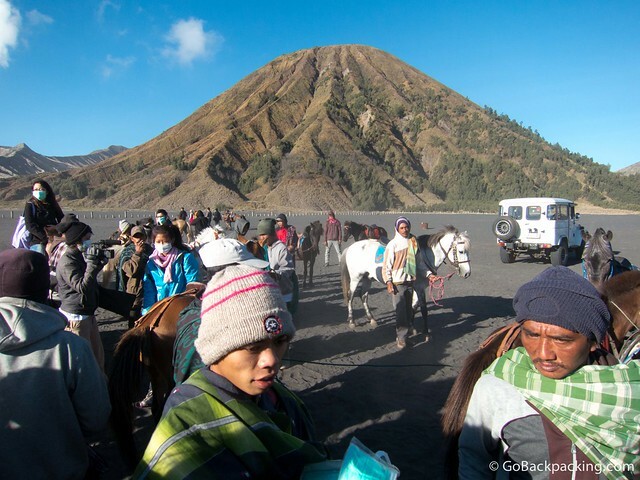 A lot of ash was being kicked up by the people, and especially the horses, as they walked to and from Mount Bromo. The closer we got to the volcano, the deeper the ash. At the point where the incline to the crater begins, the ash in the middle of the trail was several inches deep. Walking became easier on the edges of the trails, where you were more likely to connect with solid ground. My camera had begun giving me lens error messages, the result of ash getting into the spaces around the lens. I began to choose my moments more carefully, to prevent further damage. The horses let off their passengers just before a staircase leading to the crater's edge. Here, the winds whipped ash across the side of the volcano, making the surgical masks, or any kind of face covering, a necessity. 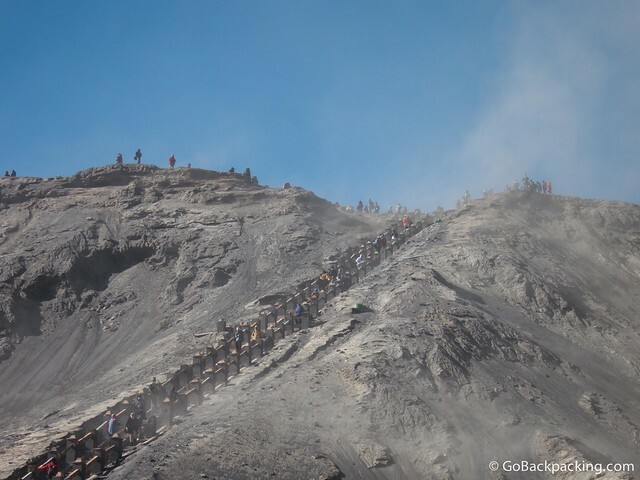 The staircase had seen better days, though the broken steps and rails seemed fitting considering its location on the side of an active volcano! 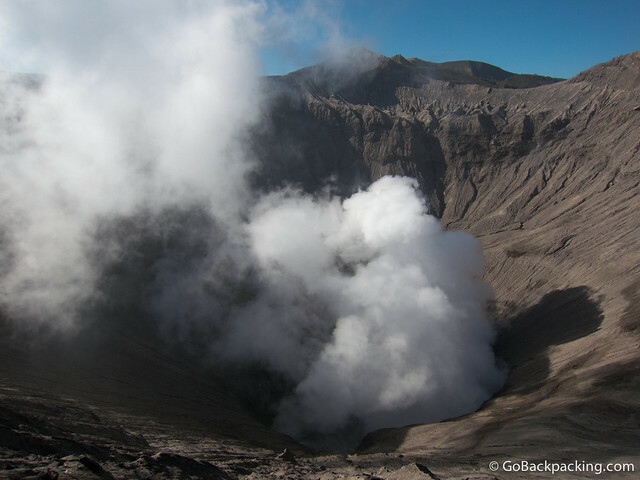 We were informed that if you watch the sunrise from Mount Bromo's crater, you can see the red from magma in the crater. During the daylight hours, though, you were only able to see the smoke. I've hiked around the active Arenal Volcano in Costa Rica, and as a kid, walked up to flowing lava in Hawaii, but this was the firs time I'd peered into the crater of an active volcano. Surprisingly, there wasn't an odor of sulfur in the air. The walk back to the jeeps went a lot faster. The scene on the valley floor was reminiscent of Egypt, and images of the Middle East. But instead of a sandstorm, we were shrouded in volcanic ash. I worried for the health of the indigenous people and horses, who were there every day catering to tourists and trying to earn a living. In the distance, we could see lookout point halfway up the mountain from where we watched the sunrise. Mountain Climbing is an exciting hobby, thanks for sharing your experience and photos in that place. Nice piece Dave. I’ve done that trip – about 15 years ago. It was awesomely good. Hardly slept a wink as it was so damn cold the night before. Java is great isn’t it! Wow, long time ago! Yea, I’m glad I had the chance to see more of Indonesia last year, beyond my first trip to Bali and Gili Trawangan. Please visit again. There are many interesting places in Indonesia. Hey Dave, was just wondering which tour company you used for this hike! Hi Alyssa, I visited Mount Bromo as part of a blog trip hosted by the Indonesian tourism authorities, so I don’t know which local company we were using as I didn’t choose them. I suspect they’re all fairly similar in terms of vehicles, guides, and prices. Hi Dave and thanks for sharing your experience. I wonder if you remember how long it was the hike up Mt. Bromo from the parking lot at the base. Thanks! I don’t remember exactly, but it didn’t take that long – maybe 15 or 20 minutes. Thanks, I was asking because they offered me a package that includes a horse ride for that bit, which seemed a bit excessive given the distance. Do you reckon it will be worth going up the lookout point later in the day ? Say 8 a.m.